A van driver has been found guilty of smashing through a wall into a garden at high speed while under the influence of alcohol. 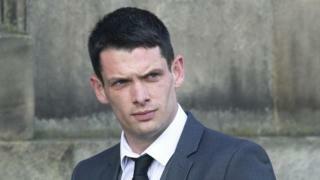 A court was told Mark Boyle collided with the wall after zig-zagging across the road and mounting a pavement in Crieff. The 28-year-old denied a charge of dangerous driving but was convicted following a trial at Perth Sheriff Court. Witness Elizabeth Dakers, 80, told the court she saw the van approaching at high speed. She said: "As it took the corner very fast it glanced off the wall on the left hand side. "It then made a right angle across the road and through the wall and halfway into the garden of the person across the road. "Our dog got a terrible fright and took off along the road." Her husband John Dakers, 79, told the trial: "The engine was revving quite loud. It hit the first wall sideways. "It zig-zagged across the road and hit the wall on the other side of Knock Road. It demolished the wall." Boyle was found guilty of driving dangerously and at excessive speed and failing to negotiate a bend in Crieff on 28 July. He admitted further charges of driving while he was more than three times the legal alcohol limit and driving without a licence. Sheriff William Wood said: "He clearly lost control of the vehicle, not doubt in part due to the speed at which he was driving."